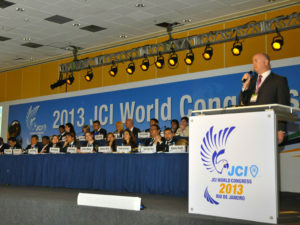 In his keynote address to the JCI General Assembly, Mr Parkes emphasized how the partnership between ICC WCF and JCI has become more important than ever, sharing a vision on how the organizations can move forward and work together, in helping JCI young entrepreneurs take a greater leadership role in addressing the concerns of the global economy, and be active constituents in its transformation. Mr Parkes also highlighted the history of the long-standing working relationship ICC WCF and JCI, not only through active global partnerships on a variety of programmes, but also through grass roots partnerships that existed between local JCIs, chambers of commerce and ICC national committees on fostering and supporting youth and entrepreneurship. “JCI’s recent global collaborative efforts have been most essential,” said Mr Parkes, referencing JCI’s feedback into the ICC global survey of business priorities for G20 leaders that has received more than 80 responses from 35 countries to date. JCI members saw job creation and anti-corruption rating high on JCI and youth lists of priorities, which appeared in the final top four priorities for ICC and global business alongside trade and infrastructure. “The input of JCI is important to bring the voice of young people to the decisions that will impact our future,” Mr.Parkes said, highlighting the challenges ahead for the World Trade Organization Summit in Bali next month and to the role young business leaders could play in advocacy work. During a separate session on anti-corruption, Mr Parkes showcased the work of the ICC Commission on Corporate Responsibility and Anti-Corruption and programmes delivered by chambers of commerce around the world, and reminded JCI delegates to make use of the tools and training available through ICC on this issue, and to partner with chambers in their respective communities on initiatives. JCI Philippines received the ICC award in recognition of its successful programme: The Next Young Entrepreneur: Bootcamp Series (TNYE Bootcamp). Run in association with Embassy of the United States and Microsoft, the programme aims to promote business to youth and inspire them to create a plan of action on how to create positive change in their own community. JCI Mali received acclaim for its programme – Pain d’or. a practical initiative aiming to promote excellence, quality and production of bread, a staple food source in the country, by training bakers on hygiene standards in the production of bread and educating retailers and shopkeepers on the storing of bread. ICC Secretary General Jean-Guy Carrier, by video message and Mr Parkes also extended votes of thanks to outgoing JCI Secretary General, Edson Kodama for his tireless efforts over the past decade in strengthening the partnership between the two organizations. Mr Parkes welcomed JCI Secretary General Dennis Cunanan as well as newly elected JCI 2014 President, Shine Bhaskaran (India) and looked forward to building on current ties as well as fostering greater collaboration and joint efforts, not only globally but at the regional and local levels of the respective networks. Mr Cunanan looked forward to his future contributions and to serving on the WCF General Council. JCI is a worldwide membership-based nonprofit organization of young active citizens aged 18 to 40 dedicated to creating positive change. Through projects in more than 5,000 communities across more than 100 countries, JCI provides the opportunity for young people to develop the entrepreneurial and leadership skills and seek targeted solutions to local problems to create a sustainable global impact. For more information please visit ICC World Chambers Federation.